Big brother. Snooping. Call it what you like but it’s a reality. If you’re not tracking your email newsletter opens, you could be missing a huge opportunity to strike while the iron is hot. 2. Clicked through to view a listing on your website. If any of these people are a current homeowner and they’re looking to buy, there’s a good chance they’ve also got a house for sale. This is gold to the savvy real estate professional—almost as good as spotting a competitor’s car parked outside someone’s house! 66% of people now read emails on their phone. It’s cumbersome to read a PDF attachment on even a large phone screen – viewing an A4 page shrunk to 20% is enough to send anyone to Specsavers! HTML email newsletters are “responsive” – they adjust images and text to fit the appropriate screen size. This makes your email newsletter (and YOU) look highly professional. In addition to point 1, even if people are on a PC, very few take the time required to open an PDF attachment unless it is information they urgently need. HTML email newsletters display all text and images on screen, immediately when the email is opened. Many more people will read your newsletter if it is in HTML email format versus sent as a PDF attachment. Disclaimer: Please accept our apologies if these instructions are not 100% accurate. Although checked for accuracy at the time of posting, cloud technology changes daily. Method 1 is faster and easier but may not contain a preview of the image you want to display. Method 2 gives you control over the image to display instead of letting Facebook choose for you. Prize draws and competitions foster customer loyalty. FMCG (fast-moving consumer goods) manufacturers have run competitions on shampoo bottles and ice-cream packets for decades. Why Offer a Prize Draw in Your Newsletter? A real estate newsletter future-proofs listing opportunities, so you don’t lose them through a “hole in the wall of your business”. 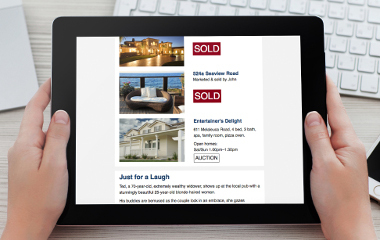 Not sending a regular real estate newsletter? …losing dozens of potential listings through a big, leaky hole in the side of your business. In real estate marketing, size matters. Why? Real estate prospecting is a numbers game. If you can double your numbers, you can double your income. Knowledge in print is a powerful tool to position you as the local real estate expert. Old school real estate marketing: “It’s all about me.” To be heard above the rest, it now has to be all about the customer. The way the world does sales is changing. If you’re not doing this, you’re making a big, big mistake. 1. A marketing plan to FREQUENTLY promote their services and dominate their area. Every household in their farm area. Generate referrals by providing outstanding, extra-ordinary, unexpected customer service worth talking about.